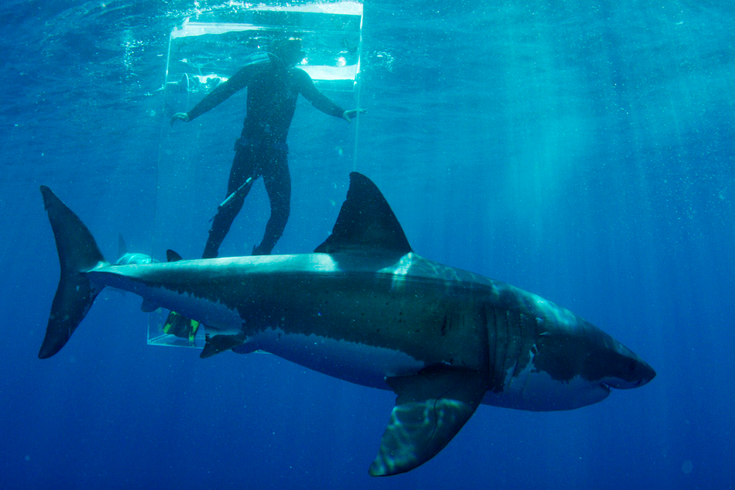 In this 2015 photo provided by Discovery Channel, a great white shark researcher stands in the clear shark cage while a great white shark swims by during an episode of "Shark Week." Now in its 28th year, the Discovery Channel's 'Shark Week' has been amplified by a national frenzy over recent shark attacks and sightings along both U.S. coasts. So, are the fears of American beachgoers justified? According to a recent study led by Stanford University and the Lenfest Ocean Center, the answer is no: the present hysteria doesn't reflect the actual risk of shark encounters. After reviewing data from 1950 to 2013, the study, published this week in Frontiers in Ecology and the Environment, found that despite increasing reports of shark attacks, specifically great whites, the individual attack risk along the California coast has dropped by more than 91 percent in the last six decades. The researchers speculate that an increase in media exposure and ocean recreation have led to the perception that shark attacks are occurring more frequently. They suggest the decline in attack risk could be due drops in global shark populations or, perhaps more likely, changes in the spatial distribution of people and sharks. A conflicting report from USA Today, citing data from the International Shark Attack File at the Florida Museum of Natural History, says that the 23 attacks recorded thus far in 2015 is slightly ahead of pace for the average 30 to 40 annual attacks in the United States. In particular, the 9 attacks in both Carolinas this year may be caused by drought conditions that have led to saltier sea water preferred by sharks, according to George Burgess, of the Shark Attack File. Combined with an infusion of baby sea turtles and menhaden fish, the drought conditions have attracted more sharks into the region as people increasingly spend time in the ocean. The Stanford study puts the risk of attacks into healthy perspective for those who are anxious about heading down the shore. Ocean-goers, the study says, are 7,000 times more likely to be hospitalized for driving-related decompression sickness on the way there than to suffer a shark bite. They're also 1,800 times more likely to drown, if that helps, while scuba divers have a 1 in 136 million chance of a shark bite and surfers have a 1 in 17 million chance. Perhaps most importantly, the study notes the vital importance of sharks in marine ecosystems. With a healthier ecosystem, sharks can be concentrated in areas with stable populations of other forms of prey, such as seals. Protecting human safety, the study authors say, does not hinge on curbing shark populations. And if none of this puts you at ease, you can always lather yourself with copper acetate, as recommended by the CIA's predecessor, the Office of Strategic Services, in 1944 with a bizarre assist from culinary legend Julia Child.